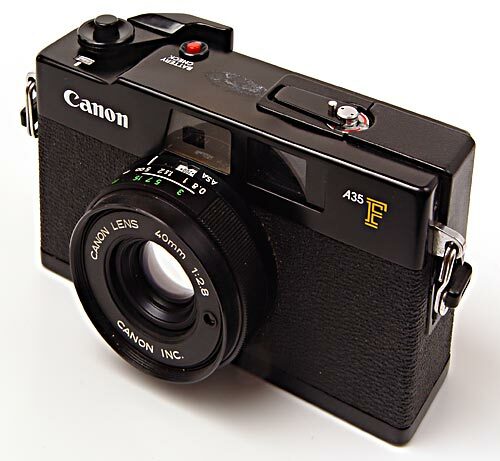 The Canon A35F is an all but forgotten 70's, consumer rangefinder. Perhaps this is because, just a year after its 1978 release, the AF35 was let loose on the world changing consumer cameras forever. The AF35 was the first Sure Shot and was the world's first Lens-Shutter 35mm autofocus camera. As such it garnered much more press and many more sales than the marginally older A35F. AF35 - stands for "AutoFocus"
The A35F was not without innovation being Canon's first camera to feature a built-in flash. As such the A35F bridges the gap between the venerable Canonet series and the new auto-focus Sure Shots. The A35F's on-board flash in combination with its black finish, do make the A35F look like an early auto-focus camera. Actually, the A35F can be thought of as a Canonet 28 and Canolite flash rolled into one stylish package. It still has pretty fast glass, a nice metal body and a real rangefinder. Like the Canonet 28 it is fully automatic when it comes to exposure. The only way the photographer can control the exposure is via the ASA setting or by half depressing the shutter release while pointing the camera at something with an appropriate amount of light before re-framing and taking the shot. 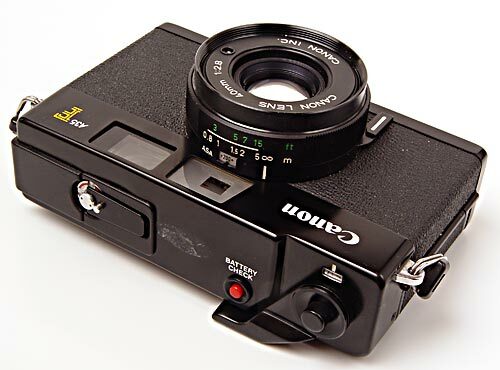 Like the Canonet 28, the A35F was supposed to make using a rangefinder as simple as possible - it was a point-and-shoot camera of its day just before the auto-focus revolution destroyed the consumer, rangefinder market. Perhaps because of it's lowly status, at a time when Canonet G-III 17's where fetching $60-100+ I picked up this example from eBay for $8 (that included shipping!). Here's a camera you might just find in among the plastic disc and 110 cameras at your local thrift store. For a cheap, true rangefinder experience the A35F is pretty hard to beat. In use, the only difference between the Canonet 28 and A35F is the Canonet has a hot shoe and an aperture ring; the aperture settings only come into play if you are using a flash other than the Canolite flash. As you can't use a flash other than the built in one this feature is not necessary on the A35F. The A35F's viewfinder is bright and easy to use. Aperture settings are reported in the viewfinder with a swing needle but you have to estimate what shutter speed the camera will choose for you. You can be assured that it will be 1/60 or greater but beyond that you're on your own. The 40mm focal length is useful and the lens is nice and contrasty. ASA settings are limited to 25-400 which some may find too restrictive. Power for the exposure setting was provided via a 1.35v H-D mercury cell (no longer available). Luckily a cheap and easily available hearing aid battery can be substituted without any adaptation. Others report using an alkaline battery substitute without issues but I do not like the decay pattern of these batteries (1.5 - 0.9v over their life) in cameras not designed for them. The modest flash (guide number 12) is powered by a single AA battery which, when activated, takes 15-20 seconds until the ready light comes on. There's no off switch for the A35F's exposure system except for the lens cap or putting the camera in a dark case. If light is hitting the CdS cell, power is being used. 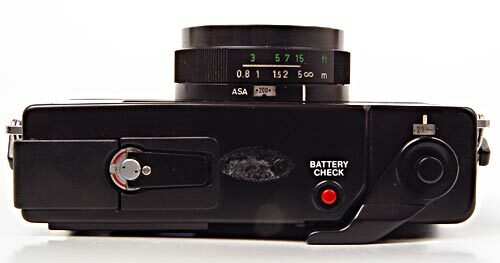 As the camera is always on, if you leave the battery in and the lens cap off while your A35F sits on a shelf it will slowly sap the power from your battery. From experience, if you want to display your cameras it is always worth removing all their batteries. All I had to do was clean out the battery compartments and replace the gummy light seals to get my example working. 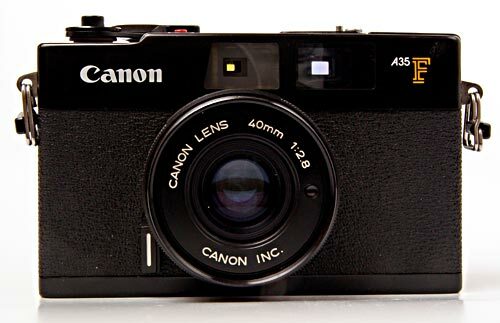 I just bought a great example of Canons A35F. I had it for two days now and I really love it! Its a nice and handy, nice designed and genuine camera which I will probably carry everywhere. Honestly I prefer these rangefinders rather than autofocus cause when manually I decide what to focus on, not the cameras "decicion". I just sent my first testroll of film to see if it does exposure correctly and to see the result. I feel like I have done a good deal, I payed SEK 90 (swedish kronor) for it via the netauction site www.tradera.com. this camera had never been used after layin around for 20+ years until recently shot a test roll with kodak 400Tmax b+w.Fantastic! results with detailed nicely contrasted prints,truely profesional who needs a Leica! I have an af35 that I picked up in a box of cameras with exactly the same issue. Unfortunately there's no simple fix unless you don't mind being a bit 'ghetto' and duct taping the back closed. To fix the camera properly you need a donor camera from eBay with which you can swap backs. It's a pity as the AF35 has a real nice lens. I hope you get yours working. I just found this camera in an old suitcase of mine. Excited to see other people still use it. I haven't used a rangefinder since I was just a little kid. If you can post a photo of the broken latch, maybe I or someone else could help you with a solution or workaround that doesn't involve duct tape! I own and use an A35F which I bought on Ebay for about $35, including the typically dillapidated case. I had a C.L.A service done to it and it works beautifully. Thankfully, I stockpiled a dozen 625 Mercury cells, so I dont have any issue with voltage etc. The shutter on this camera is truly whisper quiet. As far as concerns that I've heard about a "stuck" back door...that is usually due to gummed up or deteriorated light seals i.e they actually act like glue and make the camera back stick to the body.. Replace the seals and you should be ok to shoot with this gem of a camera. The 40mm 2.8 lens is an excellent performer. I typically shoot with Kodak T-Max 400 B&W or for less formal shooting, Fuji Superia 400 color print film. I always take this camera to France with me and not surprisingly, this camera (along with my Fuji DL 300 with 35mm 2.8 lens, another unsung hero)takes the best pics. The above review mentions the A35F can use a regular hearing aid battery instead of the old mercury cells. Can someone tell me which specific, currently available battery will work best? Hi, I just found my mom's old A23F, so far everything seems to be ok except the shutter release button doesnt always work, just wondering if theres any advice or any other problems i should look for before trying it out. I have one - canon A35 F - I always thought it was a great camera for actually taking pictures as opposed to some sore of iconic "rangefinder" og the gods. It just works great, I love it and now I know more about it. I inspired me to find a fully manual range finder - an old Ricoh 35 - also not held in tremendous estime but also a great work horse. There are so many great cameras out there for just a few dollars. I'm having to close the comments on the A35F for a while due a spammers having latched on to this post. Normal service will be resumed once I work out how to control the spam better.